First off, I’m so sorry to have been MIA on the blog for so long! If you follow me on Instagram, you now know why…I’m pregnant with #3! Our new baby girl is due December 3 and we are all so excited…especially Wesley and Mirabel! The first trimester was rough, hence my absence here and on social media. But things finally feel like they are turning around! I’m excited to be back blogging though I’ll admit posts probably won’t be regular from here out. It’s not easy juggling two little ones plus one on the way! 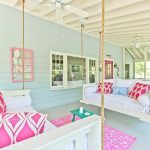 I’ve been antsy to share this absolutely delightful beach cottage with you guys! 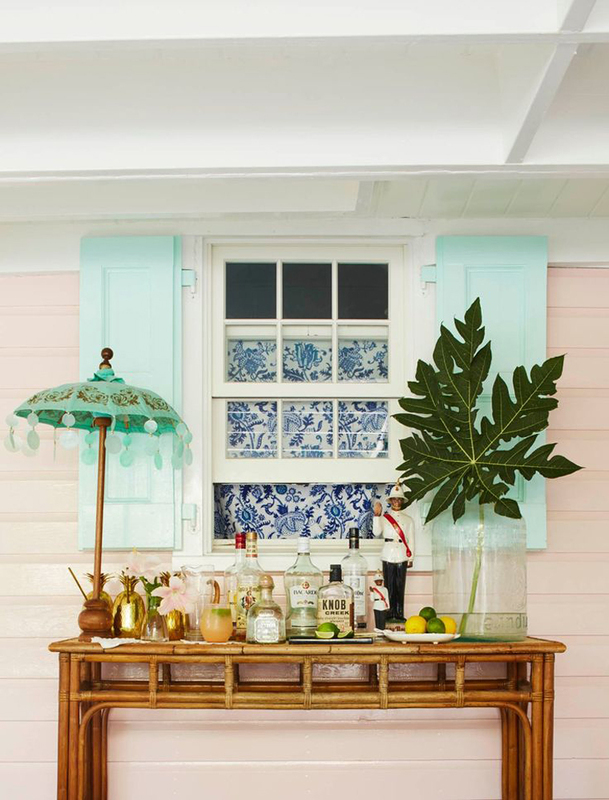 Chatterbox, a Harbour Island, Bahamas classic colonial designed by New York-based Trish Becker, was featured last summer in Coastal Living–photographed by Annie Schlechter and styled by Liz Strong. 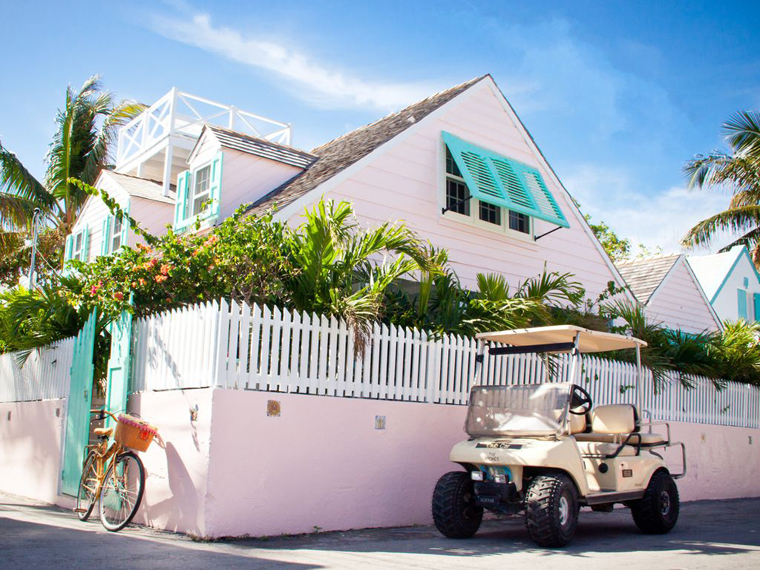 Located in the heart of Dunmore Town, the cottage was built in the late 1800’s and embodies old world Bahamian charm. 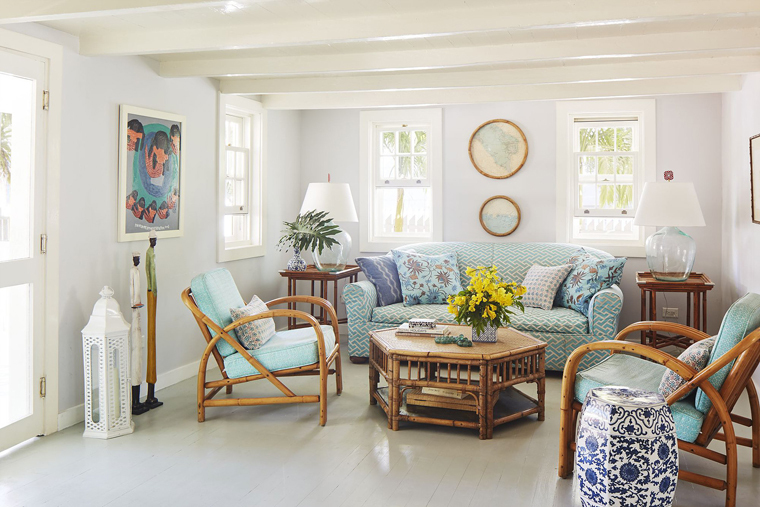 The designer worked with de la Guardia Victoria Architects & Urbanists, Inc. and Owen Higgs Construction to restore the historic home to its original glory, filling the home with colors, patterns and textures perfect for a Carribiean getaway! 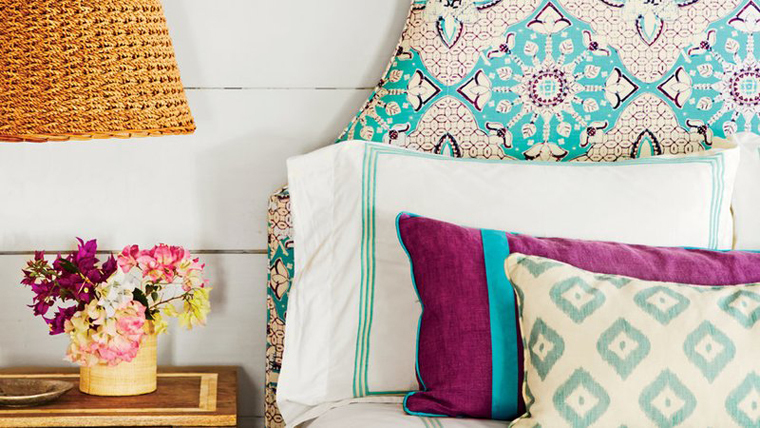 The color palette is downright dreamy! The siding is painted Powdered Petals while the shutters are painted Minerva, both by Pittsburgh Paints. The tile inlay on the front porch, a reproduction of the original, is such a unique detail. LOVE the swing too! I love how China Seas Aga Reverse updates the look of the sofa. 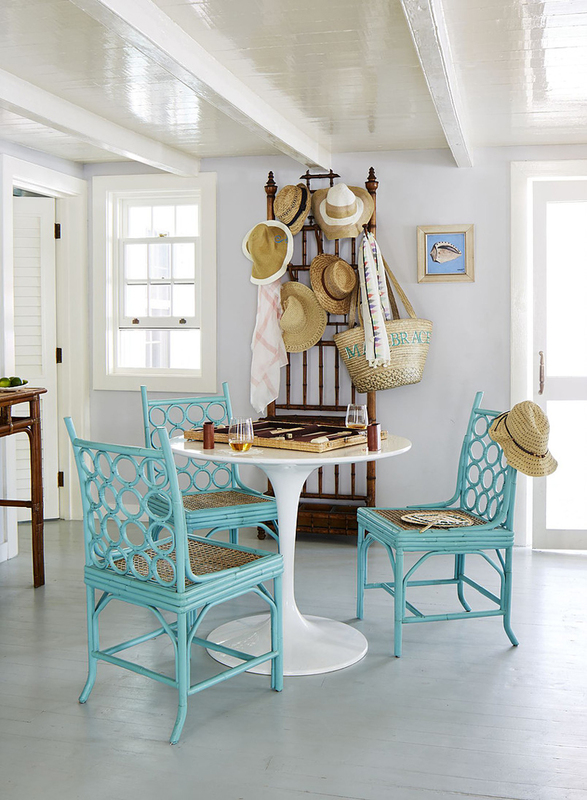 I need those fabulous hoop-back chairs (in Cooled Blue finish) from Red Egg! 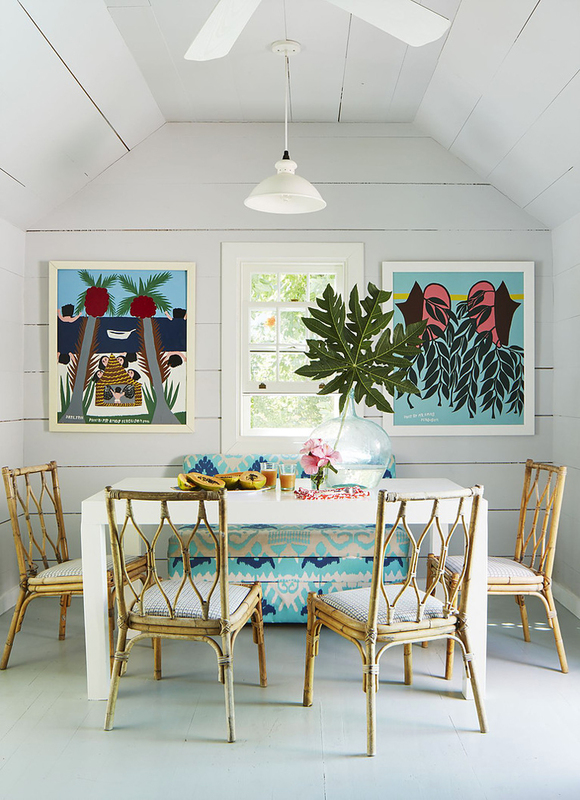 The bench covered in Quadrille’s Kazak fabric totally makes the dining area! The master bedroom is total perfection. 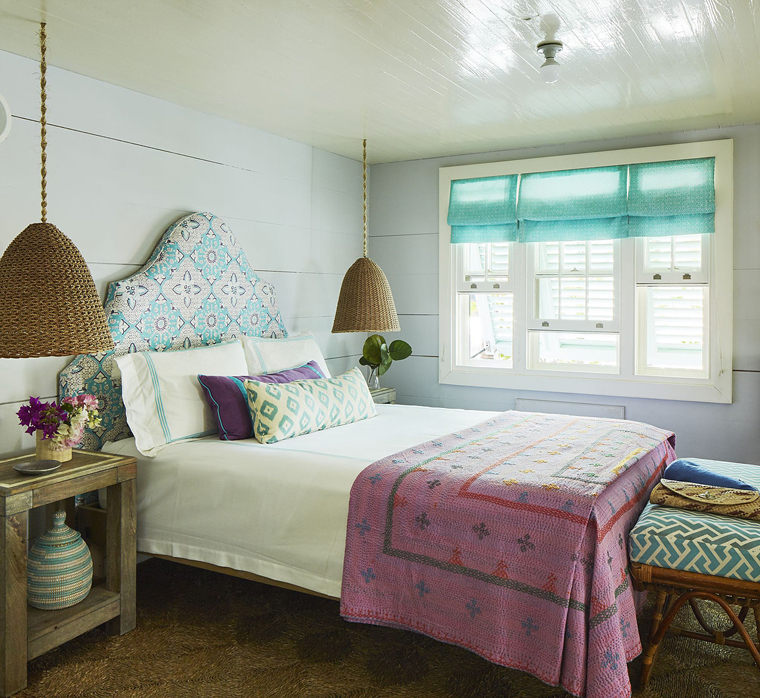 Love the Suzanne Kasler for Ballard Designs headboard covered in China Seas New Batik. 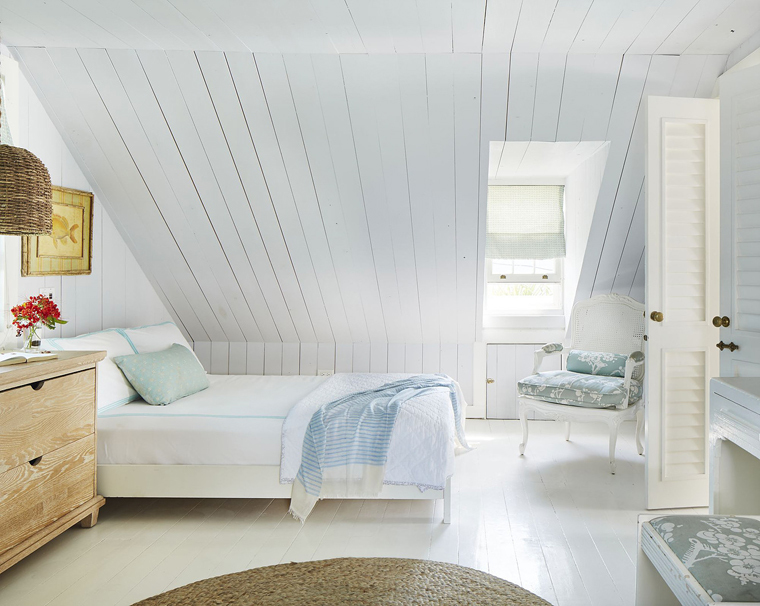 So much charm in this simple white guestroom. 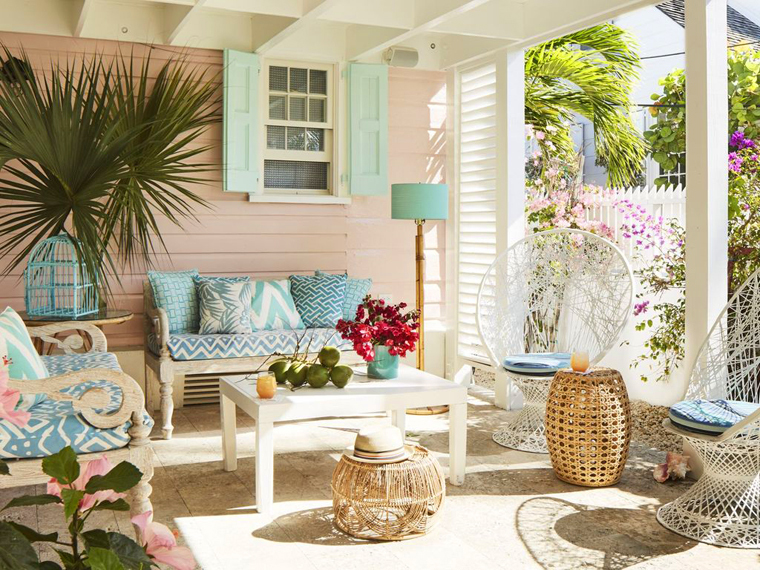 Loving the breezy Dutch doorway leading out to a turquoise-filled rooftop deck. 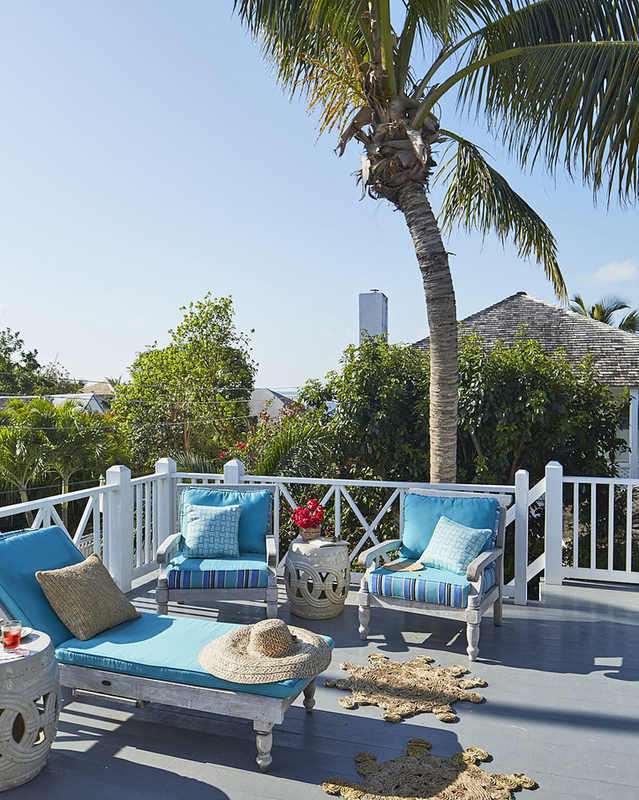 You can see 360-degree views of the island and the ocean from the the widow’s walk! What’s not to love?! I’m happy to report the cottage is available to rent through VRBO! 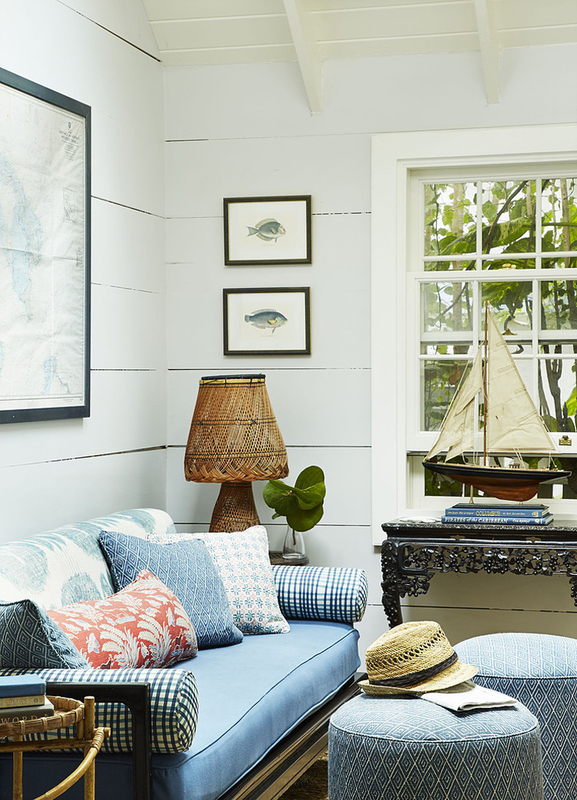 For the story behind the home and to learn more sources, read the article on Coastal Living. 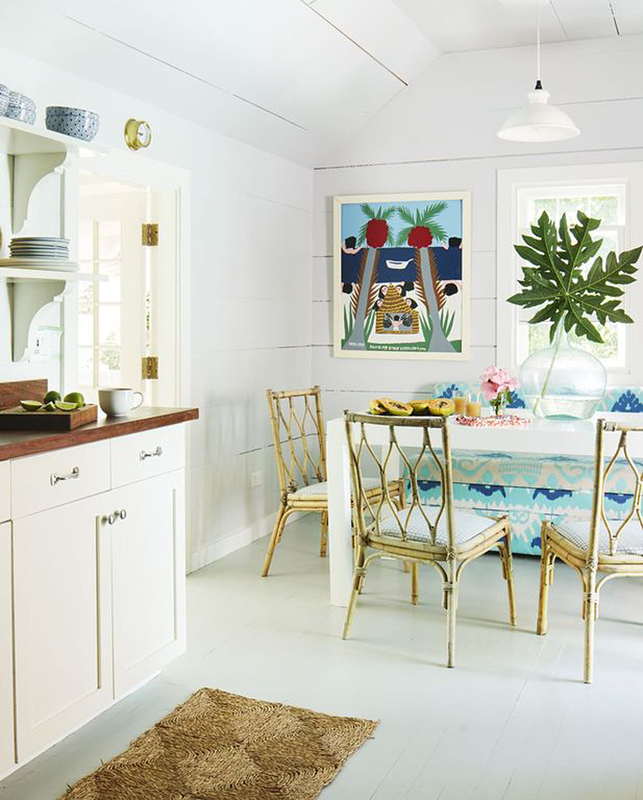 The designer Trish Becker has lovingly restored two other cottages on Harbour Island (also available to rent)…check them out here. Take a look at her beautiful jewelry line too! Congratulations on your third!!!! So glad you are feeling better!!! What a difference a month or two makes!! Love this little pice of heaven! I defiantly lean towards a softer pallet and this fits the bill! Congratulations on your new addition to the family! So happy for you. You take care of yourself now! THERE YOU ARE! So glad to see you’re back! Congratulations on baby #3, she’s a great reason to take time away from your blogs and social media! This cottage is PERFECTION! 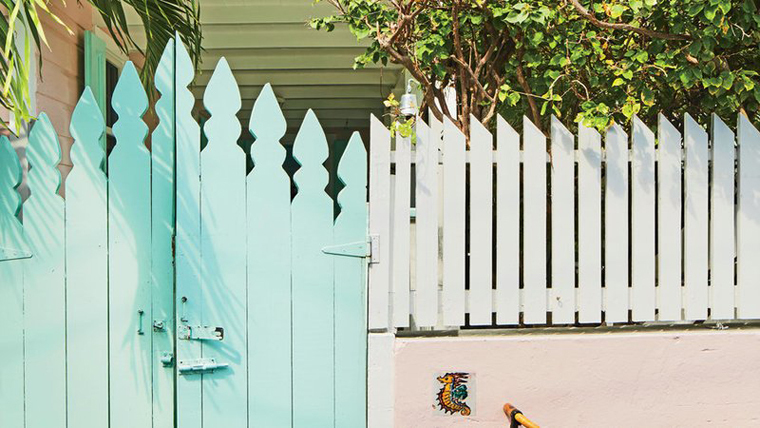 A pink house with aqua shutters (though, honestly, if she were mine, I’d reverse that and paint the house aqua with pink, peach, pale yellow, and white trim/accents!). 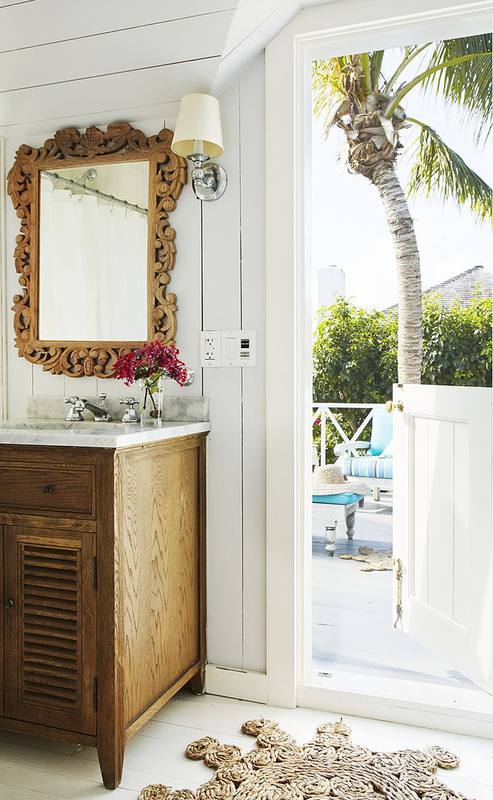 And by the beach, too – it doesn’t get better than that! I’m glad you’re back and all is well. Looking forward to #3 in December! Love the post. Congrats. Miss your posts when you are MIA. Cheers. Congratulations on #3, how exciting for all of you and glad you are feeling so better. 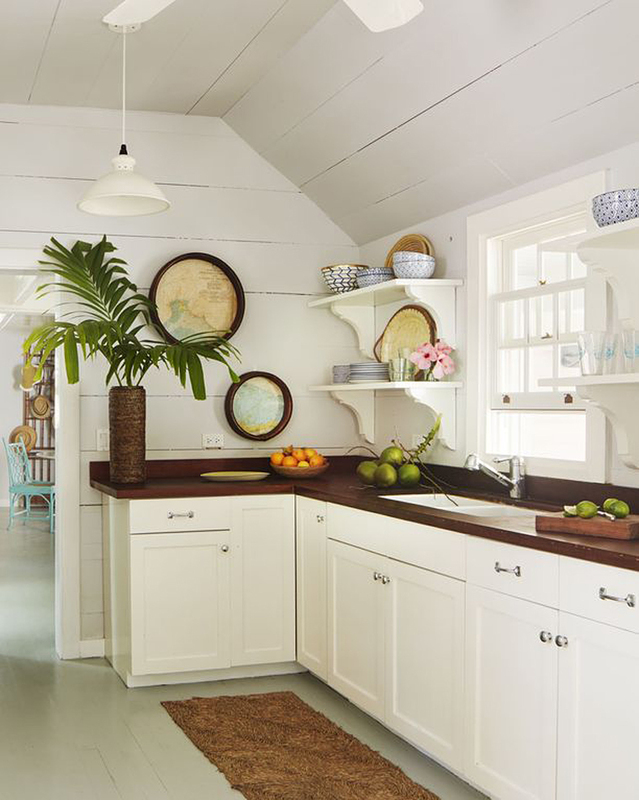 Love the island house. Congrats! So cute! 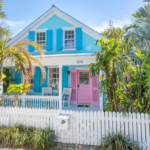 Love a good Bahamas house! This is the CHATTER BOX (yes, that’s a word) place you’ve ever shown! i love the Pink and all the bamboo inside. Its adorable!!! Would love to hide out here for a couple of weeks.